In 1887, after one of Yale’s football victories in Chicago, a young man playfully tossed a boxing glove at another young man who struck it with a pole; this was the incidental birth of a brand new variation of baseball, known as softball. Today, there are over 17 million softball players in the United States alone. Serious softball players know that there are important distinguishing factors in softball that differentiate it from baseball; aside from underhanded pitching, the ball is heavier and bigger (12 inches compared to a baseball’s 9-9.25 inches) and hitters can’t steal bases until the pitch is live. Nevertheless, the need for a properly balanced and well-designed bat is no less vital in softball than it is in baseball. The following slowpitch softball bats are popularly considered to be among the best on the market for their quality, durability, and reliability for casual and professional players alike. The DeMarini “ONE” slowpitch bat is made with an alloy handle and a 12″ long barrel. The end cap is formed in a dish shape. Owners of the bat have testified that the bat possesses a great pop as soon as its been broken out of the plastic wrap, though there is some time that should be given for the bat to be properly “broken in” before it’s completely able to reach its full smashing potential. Some customers have suggested that the optimal number of hits that need to be made with the bat before it’s completely broken in is around 300 or so. The bat features several number notches at the top of the bat that can tell the batter where to rotate it for the next swing. The number notches can help the batter gradually break in their bat more thoroughly as long as they continue to strike with the full circumference of the barrel. As long as the bat is constantly rotated with the successive hits that it makes, its overall lifespan can be increased by a substantial margin. One customer testified that after about 200 hits with the bat, the balls started to pop off with an impressive amount of power. They found that the bat had a very satisfying amount of control, giving them just enough dexterity in their swing to spin the ball to its right side. The customer found that the weight of the bat made it a very balanced and dependable tool, with serious distance potential if the batter can manage to hit the ball with the relatively large sweet spot. Along with the large sweet spot and impressive balance, the owner found that the bat was quite durable as well. Between the bat owner and their team, the bat owner reported that they had put in about 1500 hits on it between batting practice and their games. Even after 1500 hits, the owner stated that there were no signs of serious wear and tear. The owner found that the bat is able to hit 300/52 and 375/44 with impressive consistency. The only real drawback to the bat that the owner found had to do with the break-in time. It may take some players longer than others to rack up 300 or 400 hits, which could potentially present a test of patience. The owner also noted that the bat doesn’t give much audible feedback after it’s swung, which some players who like to hear the “crack” of their hard swings might find a little bit disappointing. Overall, the bat is a perfect fit for players who have very well-balanced and technically sound swings. Batters with more experience and ingrained muscle memory for the sport will have an easier time performing well with the bat when it’s taken out of the plastic and still needs to be properly broken in. Once the bat has been properly broken in, the consensus is that it’s very much worth the wait. The Demarini “ONE” slowpitch bat has been approved for play by USSA, NSA, ISA, and ASA. The 2015 Louisville Slugger Vapor slowpitch softball bat is made with 7050 alloy, has a 12-inch barrel, and a 7/8″ tapered handle. The entire bat is 34 inches long from head to handle. Customers testify that the bat takes a bit of breaking in before it can achieve the maximum amount of “pop”. Typically, it takes about 200 or 300 hits before it reaches its maximum distance potential. One customer testified that they used the softball bat for about 125 cage pitches, and in just that short amount of time, they were highly impressed. Both the weight and the length were perfectly sufficient for the owner to get consistently strong hits in the cage. Another customer testified that they purchased the bat for their co-ed slow pitch softball team, and just about all of their players found that the pop was impressive enough to make it a new favorite. The owner found that the bat was just light enough for all of the girls on the team to use it easily, yet at the same time, solid enough for all the guys to want to use it as well. Another customer reported that the softball bat was strong enough to last through the entire league’s season. The only drawback that they found with the bat was related to its heat resistance. The customer left the bat in their car after the game, and they reported that they saw slight signs of expansion due to the heat exposure, which caused the sticker on the handle to become slightly pushed off. Overall, the Slugger Vapor is a balanced bat that customers have found to be particularly well-suited for power hitters. Players who can regularly knock balls out of the park will be able to make the most of the bat’s latent strength, in spite of the fact that it isn’t the most powerful bat on the market. Though it isn’t at the top level of striking power among all bats, customers find that it is still strong enough so that even non-power hitters can still achieve respectable distance with enough practice. As the bat is made of alloy, batters who use it might be able to experience the coveted “trampoline” effect with its sweet spot, in which the bat’s material bends slightly inward upon impact and then pushes back to propel the ball with extra force. The value of the alloy will depend heavily on the goals of the individual player and their own level of skill at bat. Rising power hitters will likely find this bat to be a decent choice for transitioning between light-strength and heavier-hitting bats as their natural level of power improves. The Louisville Slugger Vapor slowpitch softball bat has been approved by the ASA, USSA, NSA, ISF and the ISA. The bat can be purchased at 26 oz, 27 oz, and 28 oz versions. The Easton SP14S500 S500 bat is made with 7050 Aircraft Alloy, allowing users to swing it with considerable amounts of speed without sacrificing too much power. The aluminum that reinforces the bat is designed to be highly durable, ensuring that it has enough longevity to withstand extended use by power hitters. Customers have given testimonies of the bat’s durability making it quite suitable for practice sessions. While players have found that the bat is slightly below the strength class of bats that are slightly costlier, it’s strong enough to help users perform optimally in recreational leagues. One owner reported that the impact of the bat gave off a metallic “ping”, creating a significant amount of vibration in the grip that some users might be more comfortable with than others. In addition to being a strong practice bat, the owner found that the S500 was well-suited for being used as a bat for backup teams. One customer testified that composite bats, which are typically much more expensive, generally won’t help the batter achieve that much more distance unless they already have sufficient power on their own. The reviewer found that this particular bat could serve as an effective way for new players to develop their skills up to the point at which they’re ready to make the transition to a bat that offers slightly more distance potential. In another testimony, a customer testified the bat was a potentially good fit for older players, due it being relatively lightweight. The customer stated that the bat’s low weight ensures that it can be swung quickly by most players without demanding much strength, though it would be more practical to aim for base hits rather than home runs. Despite being so light and only possessing moderate strength, the customer reported that the feeling of holding it was comparable to that of a composite bat. Another reviewer noted that it was unlikely for players to get many home runs with the bat unless they already have a serious level of strength and experience, at which point they could more effectively use a more expensive bat with more heft; nevertheless, the balance of the bat was still enough to earn their recommendation for any players still developing their skills. At the time of their review, the customer reported that they had managed to get in over 600 hits without the bat showing any signs of damage. All in all, the bat’s balanced properties make it an optimal choice for recreational players. While the bat doesn’t possess the same degree of ‘pop’ as the more expensive composite bats there are on the market, it is still powerful in its own right and provides sufficient value for its price. The Easton S500 slowpitch softball bat is both ASA and USSA approved. The bat is available in a 26 oz, 28 oz, and 30 oz variation. The Easton SP14S50 S50 slowpitch softball bat is made with an aluminum alloy and a rolled-over end to give it a heightened degree of durability. A reviewer testified that they purchased the bat as a gift for their son’s birthday. The next day, the reviewer took their son to the batting cages to start breaking the bat in. The reviewer reported that the bat was lightweight enough for them to hold for hours without feeling any strain, but at the same time, it wasn’t so light that it was lacking in power. Another reviewer testified that the bat was a proper choice for girls’ softball teams. The reviewer gave the bat to her niece, who they described as a young girl without much upper arm strength. Even though her niece wasn’t a power hitter, the reviewer reported that the bat allowed her niece to swing repeatedly without fatigue or injury. The S50 bat’s hardy constitution makes it able to withstand use at all different levels of play, though most will be using it for the less intense tiers of competition. The bat has received certification from the ASA. As a relatively inexpensive bat, customers report that its performance is sufficiently satisfying, though naturally not in the same league as more expensive bats with higher striking power. 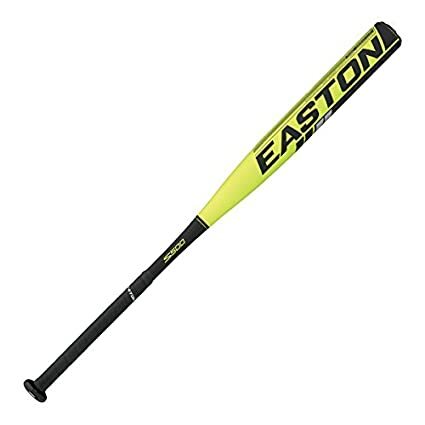 It’s a suitable choice for very young players who are looking to have their first experience with breaking in a softball bat at lower levels, and it’s also well-suited as a practice bat for batting cages or training drills. The Easton SP14S50 S50 slowpitch softball bat can be purchased in one of three different variations: 25 oz, 26 oz, and 28 oz. The drop of your softball bat is simply the difference between its length and weight. A lower drop indicates a heavier bat, and a higher drop indicates a lighter bat. Different softball leagues will oftentimes have unique rules concerning the permitted drop level of players’ bats, so be sure to consult with the necessary officials in your league in order to stay within the regulations. The low weight of a high drop bat could potentially be compensated for by a longer barrel length, and the heavy weight of a low drop bat could be made up for with a shorter barrel for swifter swings. Even though slowpitch softball may not be quite as high-impact as baseball, softball bats still take significant punishment over the course of many games, and you’ll be depending on the bat to withstand that punishment. Part of the bat’s durability will be owed to the competence of the manufacturer, but at the same time, weather conditions will also play a part in ensuring that the bat can do its job properly. If you’ll be playing softball in particularly cold or hot climates, then the interaction between the fluctuating temperatures and the bat that you use will have a real effect on the overall level of durability that it has. The bat’s toughness will be slightly correlated with the amount of time that it takes to break the bat in. Be sure to look into testimonies in order to determine the average number of hits it takes for the softball bat to be properly broken in for maximum distance potential. The weight and balance of the bat are crucial to any batter’s performance. Your strength plays a significant part in determining exactly what weight of softball bat will work best for you. Heavier and denser bats might not always be the best solution for your batting needs, but this is something that’s mostly determined after you’ve built up a significant amount of experience in the game. In general, you’ll want to have a bat that feels just heavy enough to give you momentum, but also sufficiently balanced enough so that the swing feels nice and even from the start to the follow-through. The right sizing for your softball bat will be largely contingent upon your arm length and swinging style. The length of the bat will have an effect on its balance and weight, just like its material. A bat with superior reach may somewhat lessen the margin of error on the swing, but too long of a bat could make your swing feel a bit awkward and heavy. Finding the balance between range and control is the key to achieving the best batting average. The handle of the bat should be designed in a way that facilitates constant comfort and stability through all of your swings. Some bats may have uniquely textured handles to help you establish a stronger grip, others might have padded handles for more comfort, and certain handles might have both padding and grip-enhancing properties. Keeping the ergonomics of the handle in mind will ensure that your performance doesn’t get hindered by hand cramps due to an uncomfortable grip. Though softball isn’t identical to baseball, it’s still a highly technically oriented sport that requires a meticulous level of attention to detail at the highest levels of play. The most successful players will be distinguished from the less experienced players by how critically they examine the fine details that novices would often overlook, such as the relationship between their bat’s barrel length and its weight. While the softball bat’s simple job is to help you hit the ball as hard and accurately as you need to, that job can only be consistently accomplished with a perfect alignment of all necessary elements. Look into the material, weight, length, and ergonomics of the bat with a critical eye before making a decision. When it comes to batting, every precious millimeter counts. Using the perfect bat should feel like an extension of your arm, giving you total control over the speed and arc of every swing. Just as it is not mandatory that each player performs best of their ability, it isn’t mandatory that players to invest a serious amount of time into making sure that they have the perfectly optimized equipment either; you can get a serious edge on the competition by going the extra mile when it comes to qualifying your ideal softball bat.